Just a quick trip outside of NYC sits a beautiful theater in Hoboken, New Jersey called Mile Square Theater. Celebrating their second year in the space, they kick off 2017 with Charlie Brown and the gang in You're a Good Man, Charlie Brown. The family-friendly musical, which features book, music, and lyrics by Clark Gesner with additional dialogue by Michael Mayer and additional music and lyrics by Andrew Lippa, is a smile-inducing joy that finds the heart of the beloved characters. 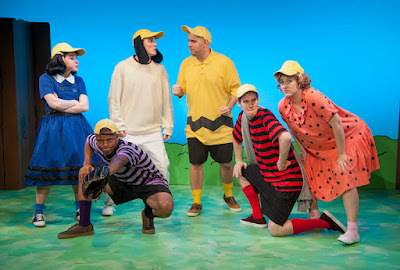 Directed by Mary Catherine Burke, You're a Good Man, Charlie Brown is pure happiness. Following Charlie Brown and the Peanuts gang through vignettes and songs, the musical brings the Charles M. Schulz comic strip to life. Set to a cute, poppy score, with updated text and songs from the 1999 Broadway revival, the heart and soul of the Peanuts is alive and well. Burke's direction is snappy. She guides her sextet of actors through a musical playground of fun and whimsy, bringing the youthfulness out with a hint of maturity. The production is simple with no real frills. If you're looking to hear the score beyond a keyboard, it's not here. It's a bit of a thin sound that seems to reduce the overall energy. But thankfully there are some powerful vocalists to make up for it. Color and vibrancy were in full force in the overall visual design. Bringing Sunday comic to the stage, scenic designer Jen Price Fick nearly captured the Schultz aesthetic. Paying attention to detail and reminding the audience that these characters are kids, Price Fick smartly raised the window heights to give the feel of tiny children. Lighting designer Elaine Wong made sure there was an exciting burst of color at all times on the scrim. Sometimes matching the mood through time or character, the color bursts were visually pleasing. The most important element in the design was the costumes. With The Peanuts being such iconic characters, not dressing them in their infamous attire would have felt wrong. Peter Fogel allowed each character to become instantly recognizable when it came to their tops. You knew exactly who each kid was. Some of those shoes, on the other hand, didn't quite mesh. One slight downfall of the production was the choreography by Sarah Weber Gallo. The choreography is gleefully playful but the group numbers needed a bit of polish. The eye desires uniformity. Whether deliberate to evoke the gawky, lanky nature of the cartoon or not, the company wasn't always in sync, making it appear sloppy. That being said, the musical staging in the numbers that lacked the flash, was superb. Happiness is watching an ensemble that is not only talented but having an exuberant amount of fun with one another. This was very much the case here. As the sole animal of the show, Brandon Santoro's Snoopy was the complete package. Santoro's physical prowess allowed Snoopy to become the crowd's best friend. He played with animated subtlety that stole the show. Chris Goodrich takes on the intellectual Linus with a giant smile and a matter-of-fact approach. Goodrich, the purist of vocalists in the gang, plays up the innocence and slight candor of Linus in the truest of ways as he listens to his sister’s little known facts and appears oblivious to his crush’s googly eyes inches away. Goodrich gets to showcase his depth as a performer through comedy and sentimentality, bringing a collective “aww” from the audience throughout his adorable and endearing performance. As Charlie Brown, the resident Blockhead, Mikey LoBalsamo highlights just how sad the titular character is. He has quite a reserved approach to the character, often fading behind the bigger personalities. Yet he found the sincerity in the role. Marcus Beckett brings soul to Schroeder. As the boy with a love for classical music, Beckett, though often the supporting character in most vignettes and songs, made a strong case for himself, and Beethoven Day. Taking on the curly-haired kid sister of Charlie Brown, Claire Rea’s Sally was sweet yet sassy. Rea found quick moments to bring the eye toward her, often having to do with Sally’s crush on Linus. They were so strong, we wanted more. Taking on Charlie Brown’s “nemesis” Lucy, Rachel Eddy gave her a sinister smile before pouncing with the insult or backhanded compliment. Eddy fit right into the bunch, making Lucy her own.